Frequent readers will know that I have a passion for sustainability in business. It’s not an earth-crunchy, Birkenstock, hippie thing for me. It’s all about business. How did I get here though, and why do I want others to drink that same Kool-Aid? Let’s look at what just happened, and then take a few steps backwards and see. 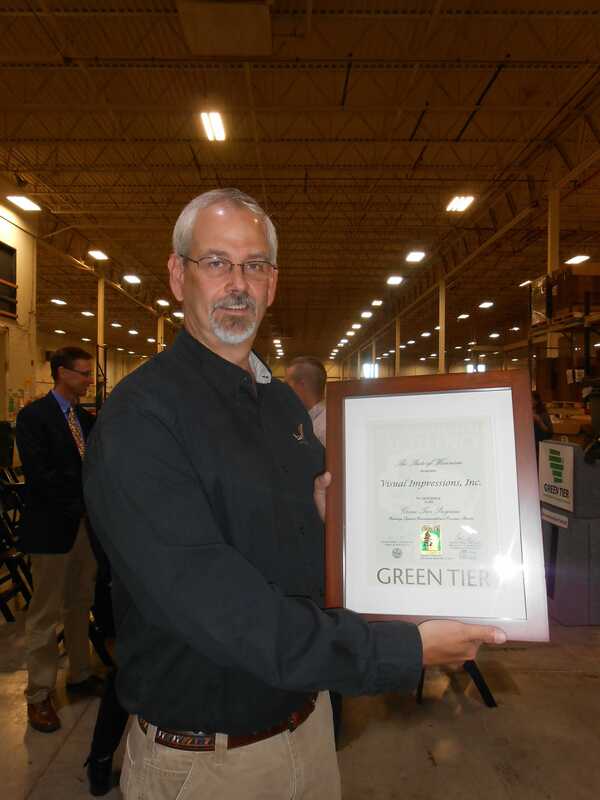 This past week Visual Impressions was honored to be the first company in the state of Wisconsin to be named a Wisconsin Green Tier company through a new alliance with the Sustainable Green Printing Partnership (SGP). This is truly a remarkable event because the state is accepting the SGP certification credentials as evidence of performance to enroll us into their program. It’s essentially a 2 for 1 sale on certifications. Who wouldn’t love that? This is a big deal for our team, as our hard work and leadership were recognized and validated by the our community. It’s an awesome feeling. We celebrated the historic charter signing with members from the Specialty Graphic Imaging Association (SGIA), Printing Industries Association (PIA), the Flexographic Technical Association (FTA), the Great Lakes Graphic Association (GLGA), and of course, the Wisconsin Department of Natural Resources (DNR) who champions the Green Tier program. Present was a fantastic mix also of customers, suppliers, and other interested parties to help celebrate. As you can see in the picture above, I’m a pretty happy guy. Proud of my team that’s for sure, as they do all the heavy lifting. So looking back, how did we get here? I have never subscribed to the notion that “things happen for a reason”, but maybe I should. I got interested in sustainability really by a fluke choice I made about eight years ago. In Atlanta for the SGIA Expo, I attended an hour long session on sustainability that was hosted by Marci Kinter. I was just promoted to Vice President of Operations (meaning you have to run things, solve problems and save money doing it) from being the Art Director (meaning you create awesomeness)…and I was looking for ways that I could make that company stronger. That discussion about sustainability and a new program called the Sustainable Green Printing Partnership had a dramatic impact on my operational thinking. Printing companies are a lot like manufacturers in that they take something, work their magic, and produce something else that ships out to the customer. Regardless of your substrate, printing techniques, or customer base; there is a process involved that has a start, a middle and an end. The notion of sustainability for print shops, takes that process and examines the best practices to increase efficiency, training programs to make your employees stronger, performance studies to find better consumables and equipment, and a closer look at the facilities that we perform in daily. There are a million questions that have to be asked and answered, and in so doing we find a better way. I left that company in 2010, and when I made my way up to Milwaukee Wisconsin in 2011 to become the COO of Visual Impressions I knew that a sustainability program had to become one of the keystones of my efforts to improve the company. The owners, Jay Berman & Todd Richheimer, agreed. One of the invaluable tools was participating in the Peer to Peer group that SGIA offers. This is a wonderful, information packed webinar program that essentially walks you through every detail of getting a sustainability program up and running. Think of it as a class that meets every other week. A few months later, your company is ready to start the certification process. It’s that good. Visual Impressions goal that first year in 2012 while we were working on our SGP certification was to save 20% on our energy expenses. This was a bold goal for us, as we are in a 100,000 square foot building and we operate on two shifts. Our committee looked for ways to save energy by examining the “how” and “why” we were consuming it. We noticed that nobody turned off the lights in the break rooms, supply rooms or bathrooms, so we installed motion detector light switches. Our team fixed air leaks on equipment to lower demand on our air compressor. The floor managers turned off fans, equipment or devices that weren’t in use. Those baby steps just examined the simple ways we could save money. We signed up for an energy audit through our local utility company, and they provided us with a report on our energy consumption and usage. They also offered some tips on how we could reduce our demand. One of the best tools I created was a spreadsheet that charted our energy metrics from our bills. 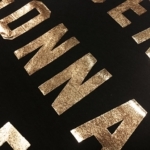 Since we are a multi-faceted contract apparel decorating shop, (screen-printing, digital printing & embroidery) everything we produce can be considered an “impression” and that equates to a unit of work you can use to measure against. If you decorate a front and back of a shirt, that’s two impressions. I put past month’s totals from the invoices and coupled with totals of our output per month, I normalized the energy cost as a “cost per impression”. This is important, as when you are busier you are going to use more energy. Increasing your efficiency, while taking active steps to lower some consumption in areas will decrease your cost per impression. This isn’t what a real job costs for energy…but just a number to measure things by and get some sense as to if improvements were working. If you want a blank Energy Usage template to use for your shop, click here. I collected other data points and took a snapshot of the company. 2011 is the baseline we measure against as that was just business as usual, without sustainability entering into the mix. I also normalized all of our controllable expenses (consumables such as thread, ink, solvents, boxes, tape, emulsion, etc. ), energy expenses (electricity, natural gas, water, & propane) and other expenses (waste removal, courier, recycling savings) and put this onto a spreadsheet where I could get a total “cost per impressions” and a “cost per order”. If you want a blank Shop Consumables template to use for your shop, click here. These were important learning steps that first year. We wrote policies and procedures, established our management systems, and started employee training programs. It was a lot of work, but well worth it as our costs dropped and we began to see some real tangible results. We fell short of saving 20% on our energy costs…but not by much. At the end of the year the total was 17.82%. One of the best things about starting your sustainability journey is that as you progress, you’ll find yourself constantly looking at all of our processes, equipment and consumables and wondering if there is a better something out there. To this day, we’re constantly striving for “better” in every facet of the company. The next year in 2013 our continuous improvement project was to start a recycling program. After a few months of interviewing partners that could help us achieve our goal, we found Pioneer Industries. Our program came fully online in March of 2013, and since then we have recycled over 91 tons of mixed paper, cardboard, plastic and metal. That was all going to landfill before, so this is a significant improvement. Because of recycling we’ve reduced our trash pick ups from three eight yard dumpsters a week to two. If we could find a way to successfully recycle the embroidery stabilizer material, we probably could get that down to one dumpster a week. That same spring we achieved our Sustainable Green Printing Partnership certification. This involved having an auditor come out to the facility and tour the plant for two days. He interviewed our staff, reviewed our programs and policies, examined our workflow and consumables, and basically poked and prodded every nook and cranny in the building. It is fairly intense, but well worth it. The good thing is that we were ready for the audit and passed with flying colors. As scary as having an auditor come to your facility sounds, this is what gives the SGP certification it’s meaning, and basically it’s teeth. Anyone can claim that they are green. The audit process is what proves it. So what does achieving certification mean for your company? Not much if you just let it sit there like a day old doughnut. However, if you leverage your work you can make it part of our overall marketing campaign it becomes a market differentiator. Locally we participated in two programs sponsored by the city of Milwaukee. 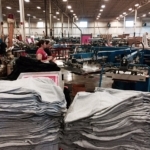 The ME2 and ME3 programs gave us a total of $100,000 in grant money for research and also contributed to the purchase of a Kornit Avalanche direct to garment printer. Many people wrongly assume that a sustainability program costs you money. Here’s proof that it makes you more competitive. Check out this great video that featured Visual Impressions – click here. In 2013 we were also named a Wisconsin Green Professional company by the Wisconsin Sustainability Council, and also nominated for Manufacturer of the Year in the small business category. People start to take notice when you aren’t just like everyone else. Our continuous improvement project for 2014 was to start trying to recycle the embroidery pellon material. Although we still haven’t solved this problem, we made significant progress and work in learning about this step. We even had a University of Wisconsin business school class tackle it as a research project. Read about their efforts here. In 2014 we resolved a huge workflow challenge with the addition of a Grunig 130 automatic screen washer for our reclaiming needs. We cycle through about 250 screens a day, and this device saves an incredible amount of time, labor and consumables. Previously, we used a small cabinet washer and a dip tank. The Grunig is basically a car wash for screens. Load them on one end dirty, they come out clean on the other. This device has a dramatic effect on the cost of reclaiming our screens. All along we’re still plugging away with our sustainability efforts. We’ve switched a few products and added some better ones. One item that’s made a huge difference is the Ozzy Clean Bioremediation unit for cleaning squeegees and flood-bars. Previously, we used a standard parts washer that you can get serviced locally that uses Petroleum Naphtha solvent, which has to be cycled out and carted off for disposal. The Ozzy Clean system uses microbes suspended in a heated fluid to eat the plastisol ink that you wash off of the items. The only by-product is water and CO2. The microbes are the same as the ones they use to clean up oil spills in the ocean. This system works so well, that we now have three on our floor (we have 13 automatic presses so we want the work to be easy for the crews). This system dramatically lowers your VOCs and costs. Since our standard screen frame is a static 23” x 31” aluminum one, we’ve moved to getting it with a special caulking system on the inside of the frame. This allows us to not have to mask off the inside of the frame to prevent ink from seeping into the joint where the mesh and the frame meet. We’re saving a considerable amount of labor in taping screens off, removing the tape…as well all those rolls of tape. Our screen remeshing and this system is outsourced to Graphic Screen Fashion down in Chicago. Finishing 2014, we were again named a Wisconsin Green Professional company, and also nominated for Manufacturer of the Year in the small business category. We are still defining our leadership and working on improvement, but it’s great when other entities recognize your efforts. For 2015, our goal has been to revamp our recycling program, as we’re segregating so much material it was getting out of hand on our floor space. We worked with our partner, Pioneer Industries, and resolved how we are staging our gaylords, adopted every other week pick up, and moved to starting to use our compactor for cardboard again. This saves on floor space and labor to handle the program as we’re touching things less. We’ve also continued our practice of recycling other materials such as outdated computers, light bulbs, waste ink, scrap wood, and anything else we can move to an alternate use. One of our sustainability committee members (Ashlee our Purchasing Manager) championed planting a vegetable garden. This was put together in a green space next to the building, and constructed out of junk shipping pallets. We’re growing tomatoes, several types of peppers, kale, zucchini, and squash. It’s delicious! Our air compressor vendor, Ingersoll Rand, helped us complete an air compressor leak survey this year too. In about two hours, they found 27 leaks in our building that cost us an estimated $4,400 a year in electrical energy as the leaks put more strain on the compressor to keep up. We’ve fixed the leaks. The survey cost $500, but we were able to get a grant for $300 from our local utility company. Not a bad deal at all. We were also reaudited by SGP again last spring, as one of the requirements is that you have to be audited every two years for compliance. One of the wonderful things to come out of that was that we had the same auditor do the work as the first time we were inspected. He was really surprised and happy to see the significant improvements we’ve accomplished since he was here in 2013. When a professional expert is impressed, you know you are on the right track. One good thing to come out of all of our efforts for 2015, is that we are going to be named a Green Master company later this year, as we have accrued enough points. This is a significant achievement, and places Visual Impressions on the upper echelon of sustainable operating companies in the state of Wisconsin. So, what’s the point of all this chest thumping rear view mirror glance at our program? Just to make a point. In 2012, we weren’t doing anything. Three years later, we’re being recognized not only statewide, but nationally as a leader in our industry for our efforts. Look at your own company. A lot of people think that sustainability costs you money. That it isn’t worth the effort. That nobody really cares. The fact is that we’ve saved a huge pile of money, been handed gigantic checks to help purchase equipment, increased our overall effectiveness and efficiency, solved problems for customers, achieved recognition, and had fun doing it. When are you starting your journey?